The difference between RIAStats.com and StatOwl.com is most likely due to polled audience. You’ll never find a report that’s of the total internet. So there will always be differences. If you look at the “Top Sites Column Chart” on RIAStats.com, you’ll see that even those site’s Silverlight install base vary widely. 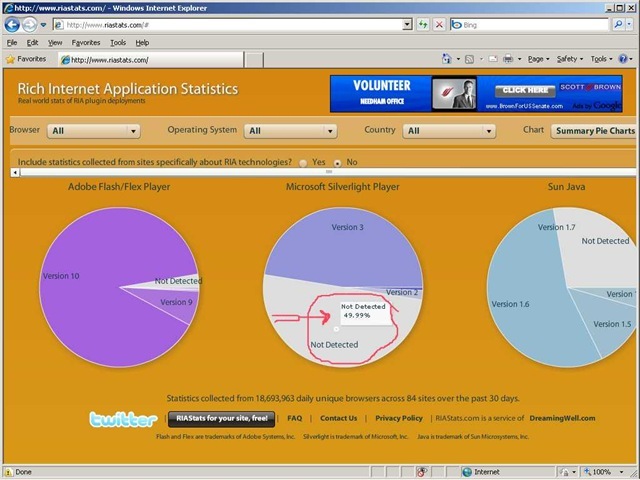 The remaining .04 percent that’s not visible on the RIAStats.com landing page pie chart is Silverlight 4. Its actually included in the Pie Chart, but .04% is less than one pixel wide even at a very large radius. You can see the Silverlight 4 representation in the “Major Versions Line Chart”; mouse over the lines at the bottom. You can add the RIAStats.com polling script to your site, and get a free daily personalized RIAStats report. Adding the polling script will help you understand your user base, and help the community further its understanding of these topics. Glad you found RIAStats useful! I am really fascinated where everyone seems to be gettting their Silverlight stats. We are itching to redevelop large e-commerce booking engines in Silverlight but to date with our own internal tracking system, only 32% of retail Mum & Dad users have it installed on their machines. We have very high traffic and many unique visitors so the average is fairly acurate….well for our sector anyway. We have scratched Silverlight for 2010 and are targetting 2011/2012 if ever. Why can’t Microsoft force Silverlight out through automatic updates instead of leaving as optional update????? @Nick – Re: “but to date with our own internal tracking system, only 32% of retail Mum & Dad users have it installed on their machines” – I think your own stats may be your best, though the overall trending is relevant. One thought though – the 32% represents those with Silverlight already running, but is a smaller number than those *willing* to use Silverlight because many users will download the player if it helps them interact with a site. Of course, willingness depends on many factors – not all sites are the Olympics. Re: “Why can’t Microsoft force Silverlight out through automatic updates instead of leaving as optional update” – I don’t know, but perhaps if they did they would take heat from anti-trust folks? Unless I’m getting all of the non-Silverlight visitors, the silverlight enabled browser numbers displayed on ria stats is not accurate.